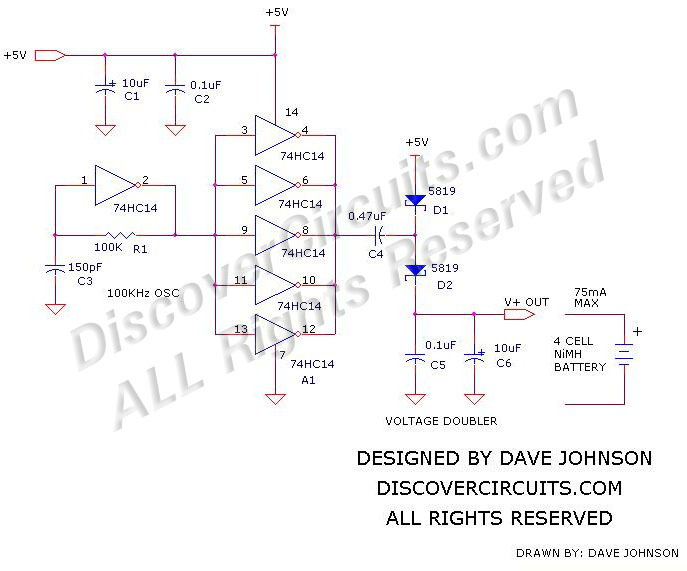 Circuit: #375+5v Powered Charge Pump Battery Charger __ Circuit designed by David A. Johnson, P.E. batteries. The circuit draws current from the +5v available a USB connection and pumps about 70ma of current into the battery. This should be enough current to fully charge a pack of 2500ma-hour cells in about 36 hours. The circuit uses a single 74HC14 hex Schmitt trigger inverter in conjunction with a voltage doubler charge pump circuit.